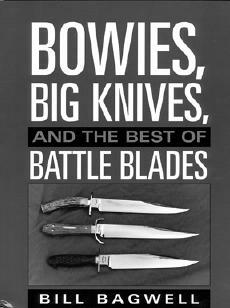 Bill Bagwell, established master bladesmith and columnist for knife-related articles that appeared in the 1980s in Soldier of Fortune magazine, keeps coming back to his conviction that the Bowie knife is the world's most effective battle blade. The advantage to this book and article compilation is that you have a worldwide glimpse of fighting knives that emerged throughout modern history. Of particular importance is the Ontario Knife Company's offering of the Bagwell Hell's Bell. Interestingly enough, this Bowie-style knife bears a close resemblance to the original sketches that I have seen at the Old Washington, Arkansas, blacksmith shop a number of years ago when I attended a number of rendezvous events at that place. While Bagwell's creation includes years of design evolution, the original design was also the result of years of knife-fighting expertise for both Bowie, his cousin and others. Some time ago Batson himself told me that Bowie most likely used a common butcher knife to dispatch his opponents in the legendary Sandbar duel, which was anything but a dignified affair! It was simply a matter of what was needed to create the ultimate combat blade. Personally, I do not want to go out and seek to get into a fight; instead, my favorite articles in the book center around presentations on maintaining a knife and keeping it sharp. That alone makes this book a must purchase for anyone who has any interest in the subject. Included is an excellent 1988 presentation, "Fold `em up, move `em out!" a good overview of those contemporary folding blades that Bagwell considers worthy purchases. This rendezvous junkie prizes his Ned Patrick-created rustic folding blade because contemporary knives would not be acceptable. And he seconds the author's comments that a knife and its selection is a very personal decision. One presentation, "Bowie Bladesmiths, 1987," brought back some wonderful memories! Bagwell included Jerry Fisk as one of the bladesmithing stars. Well, in cajun country, if our knives don't kill you, our food might do the job. Several years after Bagwell penned this article, Arkansas Master Bladesmith, Jerry Fisk, and his brother Pete, graced our presence at a shindig at Lafayette's Acadian Village. Brother Pete claimed that it was the Cajun Blaze that caused his wife's pregnancy. But the results were different for brother Jerry. We received reports that on the way back to Arkansas, Jerry had a severe attack of nature that caused him to seek immediate relief in a desolate, roadside culvert. In the process of pulling off his belt, he lost his personal, prized damascas steel blade (plus one sock used to complete the necessary operation). It took an army of friends several weeks of diligent searching before they were able to finally find and return the knife. But they elected to not return the sock!